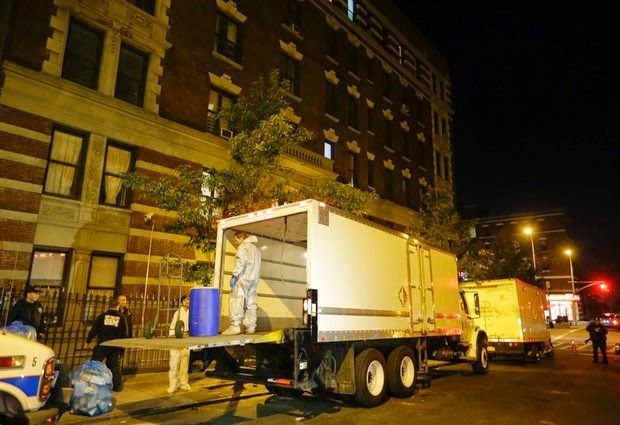 Workers from BioRecoveryCorp carry equipment from the apartment building of Ebola patient Dr. Craig Spencer in New York. Even small clusters of Ebola cases could overwhelm parts of US medical care system, according to an Associated Press review of readiness at hospitals and other components of the emergency medical network. (ASSOCIATED PRESS) -- The nation's preparedness effort to fight outbreaks of Ebola and other infectious diseases has been under-funded and lacking in political will and commitment. "We don't really have a pharmaceutical response for Ebola," said retired Air Force Col. Randall Larsen, the former executive director of the Congressional Commission on the Prevention of Weapons of Mass Destruction. "But could you imagine if there were 20,000 sick people in 10 cities and we did not have a pharmaceutical response? We would be completely overwhelmed." But a combination of budgetary constraints and politics has delayed many of those plans. Larsen said the setbacks are partly the result of an inefficient, fragmented federal system, which leaves no single agency in charge. Budget cuts also have slowed progress at the local level. Since 2002, the U.S. Centers for Disease Control and Prevention has given states and territories more than $10 billion to help public health care systems ramp up when faced with a major disease outbreak. The CDC program has been cut more than 30 percent since reaching $897 million in fiscal year 2007, which led to thousands of layoffs by state and local health departments, according to the National Association of County and City Health Officials. All 50 states and several major cities receive additional annual money through HHS's Hospital Preparedness Program, which helps private hospitals develop plans to better handle surging emergency room volume. The program has handed out a total of $5 billion since 2002, but annual funding has fallen by about 50 percent since it peaked in 2003 at $515 million as Congress lost enthusiasm for funding biodefense. Over that same period, state-level budget cuts and the congressional sequester have forced many states to eliminate emergency preparedness positions. "I do believe we are lot more prepared than we were a decade ago, but we still have work to do," Parker said. In the meantime, a flurry of Ebola-related work is further straining resources, even when such efforts turn out to be false alarms — or worse, based on rumor. Members of West Virginia's Kanawha-Charleston Health Department were recently called to Yeager Airport to investigate four passengers on a plane from Atlanta — three who started their journey in Dallas, one who started out in Houston. "Someone on the plane overheard a conversation that a passenger or passengers were coming from a Dallas hospital. No one in the meeting had any idea if these people were ill," according to a summary report. It was determined that none of the four from Texas met any CDC Ebola travel criteria, and were not symptomatic. All passengers and crew were cleared to depart the airport. The incident cost taxpayers more than $2,350 in staff time — 60 man-hours, according to records. "That's a real drain on the system every time these things happen," said Dr. Rahul Gupta, the health department's executive director. "If you have to spend that kind of money three or four times a week, it builds up."